2016 marks the first election where millennials make up the majority of the electorate. Chicago Votes, a non-partisan youth civic organization is coordinating 17 “Parades to the Polls” during the early vote period of the general election. “Parades to the Polls” foster civic participation through fun, celebratory democracy that takes young people from high schools and colleges to vote for the first time in large numbers, making the election an empowering expression of community. Chicago Votes engages young Chicagoans, specifically those from underrepresented communities, in the civic process – focusing specifically on voter registration, leadership training/education, and legislative issue campaigns committed to voter modernization and campaigns that amplify the voices of young people. “The parade is a broad opportunity to affirm our humanity by organizing and exercising our right to vote. For many of us, me included, a Black woman, this was a right we were not always afforded, and many people lost their lives. Now that we have the freedom to participate, we must use it wisely, and start our change at the ballot,” said Nicole Johnson of Chicago Votes. 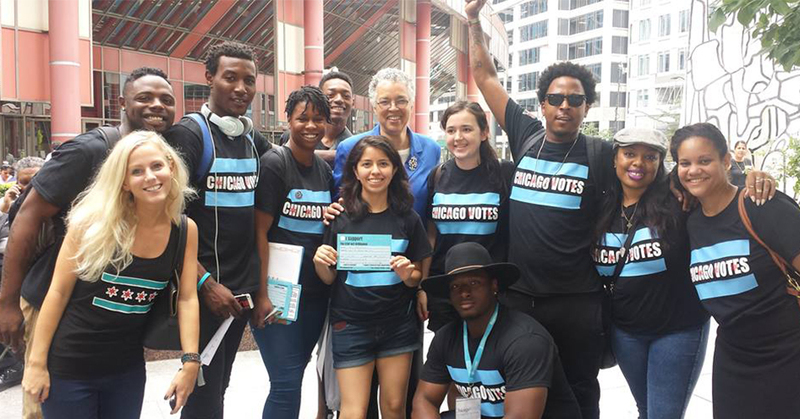 This cycle, Chicago Votes has contacted 24,000 young voters. Earlier this year, Chicago Votes, as a member of the Just Democracy Coalition, was instrumental in passing SB 250 to allow automatic voter registration in the state of Illinois. In August, Governor Bruce Rauner vetoed the bill.